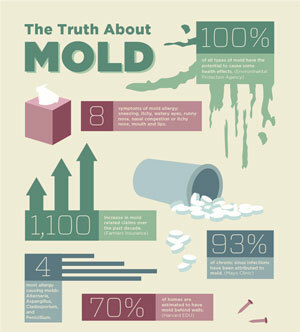 Click to learn more facts about mold! Mold is present everywhere, indoors and outdoors, as part of nature. Mold is a natural recycling system that breaks down dead matter into simpler compounds. The mold that exists in the soil and trees outside your home is not a concern, but the mold in our homes and buildings can cause adverse health effects and property damage. If indoor humidity is above 60%, risks of fungus growth rise steeply. Hygrometers (humidity meters) can be used to measure humidity accurately. The CDC recommends humidity levels be kept below 50%. 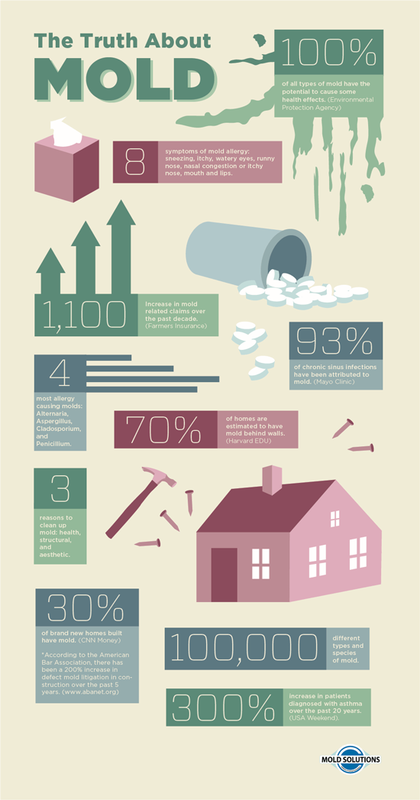 According to the Environmental Protection Agency, mold is found in 50% of all structures. In addition to health issues and property damage, indoor mold growth is also a sure sign that there is a moisture problem that must be addressed. There are thousands of types of mold, and any mold has the potential to affect human health. Mold will grow anywhere there is a food source, moisture, the right temperature, and air. Most general liability and property insurance companies now exclude mold insurance from their policies due to the increase of mold-related lawsuits. If you want to check your home or building for mold in Toms River, Woodbridge, Cherry Hill, Morganville, Bridgewater, Princeton Junction, Middletown, Old Bridge, Piscataway, New Brunswick, Lakewood, New Jersey contact Mold Solutions by Cowleys today!